This understanding of upeksha as equanimity stresses the importance of balance. A balanced heart is not an unfeeling heart. The balanced heart feels pleasure without grasping and clinging at it; it feels pain without condemning or hating; and it stays open to neutral experiences with presence. Without this recognition, it’s easy to fall into compassion fatigue, helper burnout, and even despair. 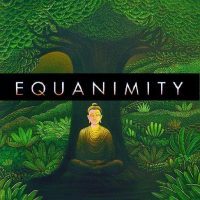 Equanimity will allow you to open your heart and offer love, kindness, compassion, and joy, while letting go of your expectations and attachment to results. Equanimity endows the other three brahmaviharas with kshanti: patience, persistence, and forbearance. So, you can keep your heart open, even if the kindness, compassion, and appreciative joy you offer to others is not returned. And when you are confronted with the nonvirtuous deeds of others, equanimity will allow you to feel compassion for the suffering that underlies their actions, as well as for the suffering these actions may cause others. It is equanimity that brings immeasurability, or boundlessness, to the other three brahmaviharas.